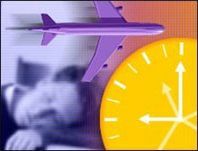 Flying to Europe from North America means your body has to adjust to being six to nine hours "early", the phenomenon known as jet lag. Given that your time in Europe will probably be limited, you'll want to get your body's clock on local time as soon as possible to maximize your sightseeing time and enjoyment. To that end, there are a number of jet lag "cures" and recommendations out on the Internet, and different things work for different people. I have my own remedy that works well for me and has helped travel companions and others to whom I've recommended it, so I'm putting it here for anyone else who might want to try it. There are two components of jet lag when traveling to Europe. First, there's the first-day "hangover" when you're exhausted from essentially having missed a night's sleep and starting your day in the middle of your normal sleeping time. The other part is the necessity of resetting your body's clock as quickly as possible to match the local time. My jet lag plan tackles both. My strategy also takes into account the fact that I won't sleep much or at all on the plane. It's not because I don't want to; sleeping on the plane is the quickest method to overcome jet lag (and makes those long hours in the sky fly by <grin>.) But I simply can't sleep on planes. I mean, really, who can sleep in those seats? And I'm usually excited about the trip and my mind is busy anticipating the adventure to come. All of that means I won't get much rest on the flight. I'm usually content on getting some of that half-asleep, half-awake meditative rest or a catnap or two. So my scheme is designed to overcome that reality. The first part of the plan is to try and "bank" some extra sleep the night before you leave. To do this, I go to sleep at my normal bedtime (~10:00pm) and then sleep late. I try to get about 10 hours. It's important to get that extra sleep by sleeping late, not by going to bed early-- I'll explain why later. Of course, if you have an early flight, then you'll have to adjust your bedtime back a little to accomplish this, but keep it to an absolute minimum. Try to finish packing and any other preparations the day before in order to give yourself that extra time for rest. Like I mentioned earlier, I won't sleep on the plane, but after dinner, I do try to relax and close my eyes and get some of that quasi-sleep. When breakfast is served, it's time to get up and start the day. All I drink during the flight is water and juice, and coffee with breakfast-- no alcohol (there's plenty of that waiting for me on the ground! <grin>) Alcohol actually disturbs your natural sleep cycles and ends-up making jet lag worse. Once we land, I hit the ground running. No napping during the first day, period! That's my most important tip for overcoming jet lag. No matter how tired you feel, you have to fight the need for a nap that first day-- if you don't, you're just delaying getting your internal clock reset. If I'm feeling a little drained, I'll stop at a café and have a pick-me-up coffee or soda. Lunch is a light meal as heavy meals will just make me more sleepy. Dinner can be moderately heavy and that's the first time I'll have a beer or glass of wine, but only one that first night. Again, too much alcohol actually disrupts your sleep and that first night's sleep is critical and needs to be as restful as possible. Bedtime is no earlier than 9:00pm local time but no later than 10:30pm. The next morning, wake-up is at the normal time, 8:00am or so and viola, my internal clock is reset and I'm fine for the rest of the trip. So how does this all work? Since you essentially miss a night's sleep going to Europe, you have to mitigate that. Normally, missing a night's sleep means you're awake for about 40 straight hours, give or take (we'll call this the "sleep gap".) Since Europe is seven hours ahead of me (I'm in Central Time), that instantly drops the sleep gap down to around 33 hours since I'll go to sleep in Europe about seven hours earlier than I normally would. By sleeping a couple of hours late the morning of the trip, the gap is narrowed even more to a more manageable 31 hours or so. Furthermore, the extra sleep the morning of the trip "banks" a little extra rest that I can draw on during the first day in Europe, which means that I'm operating at a decent level most of that day; not 100%, but not in a zombie-like trance that means the day is a blur. Not napping and staying awake until at least 9:00pm that first night forces my biological clock to reset to local time immediately, and the slightly early bedtime means I knock yet another hour or two off the sleep gap, getting it down to around 30 hours, and allows me to get some "make-up" sleep, allowing me to comfortably wake-up at the normal time the next morning and dropping me perfectly into the local schedule. On Day 2, I'm usually at 100% again and from there I just go to bed and wake up at the normal local times. So there's my jet lag mitigation strategy. If you're headed to Europe and give it try, let me know how it works out for you. Good luck and have a good trip!